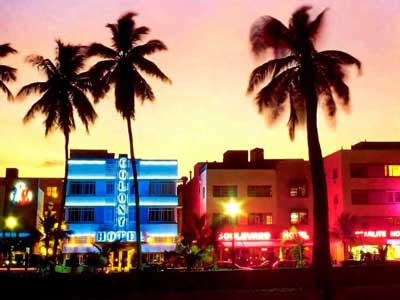 For the legion of independent filmmakers who have descended on Miami for the Miami International Film Festival, the sunny climate and welcome atmosphere is a rare oasis of warmth in a world that has become decidely chilly. At a seminar held earlier today as part of the MIFF Reel Education Seminar series, representatives presented a rather downbeat picture of the cold realities of the international marketplace. "Pre-sales of smaller independent movies are virtually impossible in this climate", Samantha Horley of Salt, a UK sales company, commented. The veteran international sales agent said that even success on the festival circuit is not the guarantee that it used to be for eventual distribution. "We had a recent film that had a great response at all the major film festivals, but in the end not one territory was sold", Horley shared with an audience of local indie filmmakers and visiting producers from Latin America and Europe. "It's all about passion", fellow panelist Rodridgo Guerrero of Colombia based production and financing company Dynamo Capital offered. "This is not about getting rich or even about the glamour of film festivals", he added, "but doing whatever is necessary to make your dreams a reality." Guerrero has produced the feature films DOG EAT DOG and SATANAS, which premiered at the Festival in recent years and has the film NOCHEBUENA in this year'ss Cinema 360 program. Frida Torresblanco, who produced the award-winning PAN'S LABYRINTH by Guillermo del Toro, stressed that first-time filmmakers need to find the ways to show what they are capable of. "My job as a producer is to interest sales agents, financiers and distributors in a project that does not necessarily have names attached", Torresblanco shared. "We need to communicate the unique vision of a director to show that not only will investors not lose their money but distributors can make the film work." Via her Ritmo Films banner based in New York, she is developing several film projects that span the North and South American continents, along with her contacts in her native Spain. "We make mistakes sometimes in passing on what seem to be smaller films", Diego Halabi, CEO of Sun Distribution, a major force in Latin American distribution, admitted. "Last year, we passed on SLUMDOG MILLIONAIRE, not quite seeing how the story of slum kids from Mumbai would attract a major audience in the Latin American market. Obviously we made a mistake on this one, but it has made us pay attention to smaller films that we otherwise may have overlooked." Halabi also described how each country in Latin America has its own distinctive culture and regional dialect, making distribution in the territory particularly challenging. When the subject of the internet, as both marketing tool and video-on-demand revenue source was brought up (by me, actually), panelists agreed that online viral marketing has benefitted smaller independent films that cannot afford big advertising campaigns or multiple print committments. "The dollar value from the internet is still an unknown", sales agent Horley commented. "At the moment, we treat it as another ancillary market, like video or television, but clearly there will be major developments in the next few years that could make it a major revenue source." Panelists and moderator Susan Wrubel, an international acquisitions consulant, cited the day-and-date releases of films in both theaters and on cable/satellite as a strategy that could make sense for smaller independent films.